Today is the feast day of St Colmcille who along with St Patrick and St Brigit he is one of the three patron saints of Ireland. In 2008 my good friend Fiona Beglane brought me to see a holy well associated with the saint. 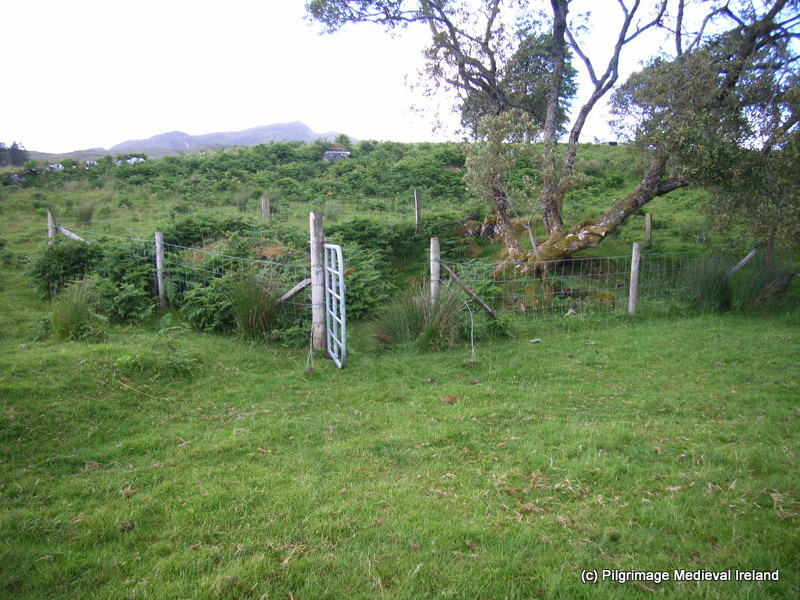 The well in question is located in the townland of Disert, in the parish of Inver, in Co Donegal. Over the last few years I have been to a lot of pilgrim sites but this is one of the most beautiful place that I have spent time. 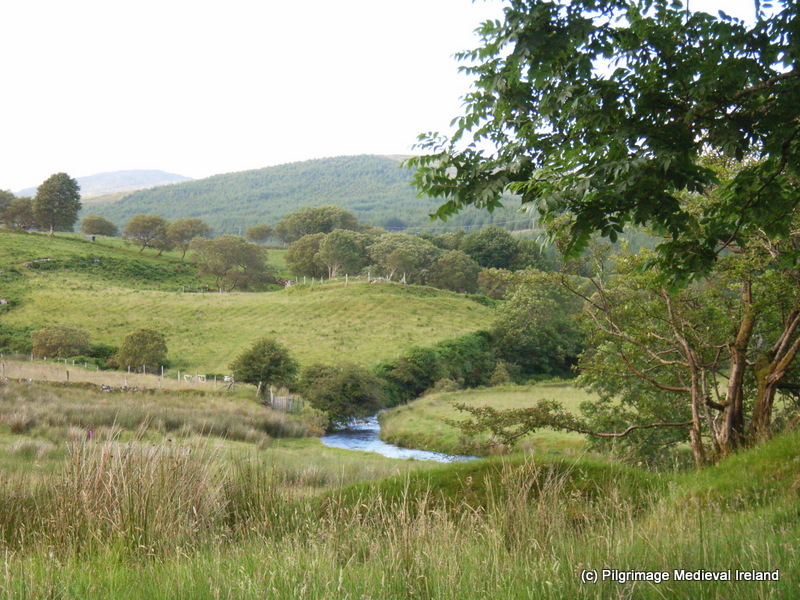 St Colmcille’s well is situated in rough pasture at the foothill of the Carnaween hill and the Bluestack mountains close to the banks of the Eanybeg river. As you can see from the photo below this is the most glorious of locations. The site consists of a holy well located close to a small graveyard that is surrounded by a stone wall and the remains of megalith and associated enclosure. All three monuments are points in the pilgrim landscape of the site. The townland name Disert (Dísert in Irish) comes from the Latin word desertum meaning desert. During the 4th century there was a movement of hermits in the East (Syria and Egypt) retreating into the desert to live a life of isolation and prayer. It is probable that the idea of living as a hermit came to Ireland from the East via Gaul and Britain. 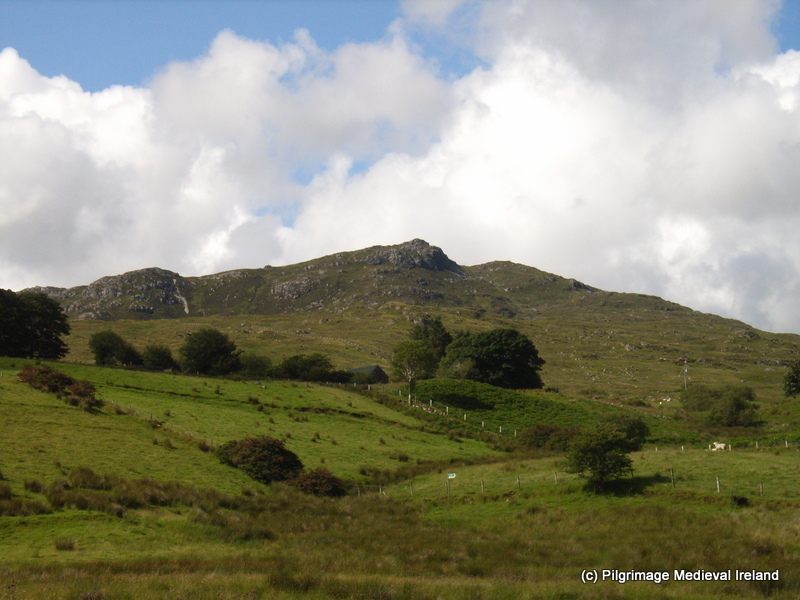 The Irish placename ‘Dísert,’ and its variants ‘Dysert,’ and placenames of which ‘Dísert’ is a component, for example, Dísert Diarmata, Castledermot, bear witness to the existence of hermits and hermitages in Ireland. There is no visible evidence of an early or late church here but according to tradition St Colmcille blessed the well here which was already of local importance. The earliest references to Disert dates to the 17th century. The History of the Diocese of Raphoe mentions that Hugh Roe O’Donnell, chief of Tir Chonaill gave an estate at Disert to the Franciscans around the year 1460. Yet according to Meehan (1997, 14) the Franciscans have no record of their order in the parish of Inver. Local tradition held that the Franciscans who fled their monastery at Donegal after the Plantation of Ulster lived east of Disert in the townland of Friary and made their way between Killymard and Glenfinn along Casan na mBrathar. Local tradition does states seven monks were buried in the ‘garden’ or enclosure at Disert (ibid). Niall O’Boyle Bishop of Raphoe died at Gleann Eidhnighe on the 6th of February and was interred at Inis Caoil (Inish Keel). Meehan(1994, 14) and the notice board at the site state it was at Disert that the bishop died and was carried out of the hills to his Kiltoorish for burial. The holy well is fenced off by wire railing. 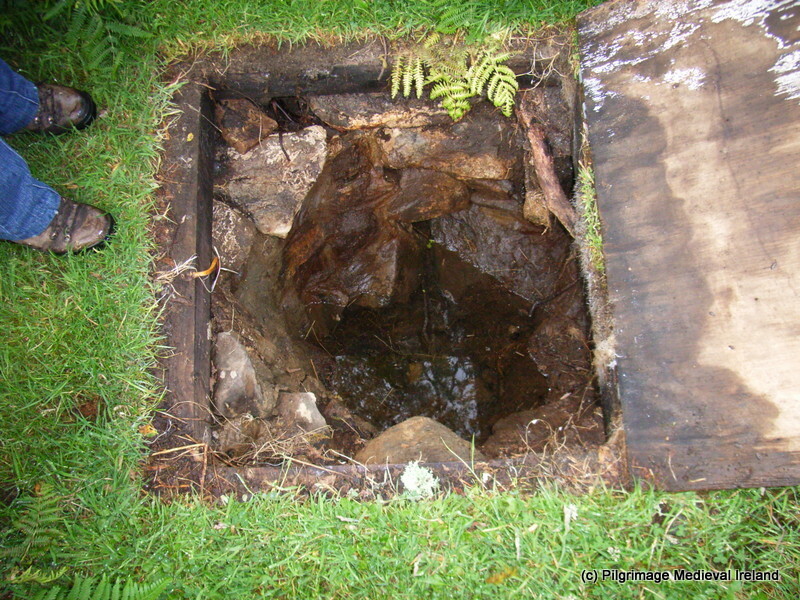 The well covered by a trap door which need to be opened to access the water. The well shaft/hole is lined with roughly coursed stones and the well very little water when I visited it in the summer of 2008. 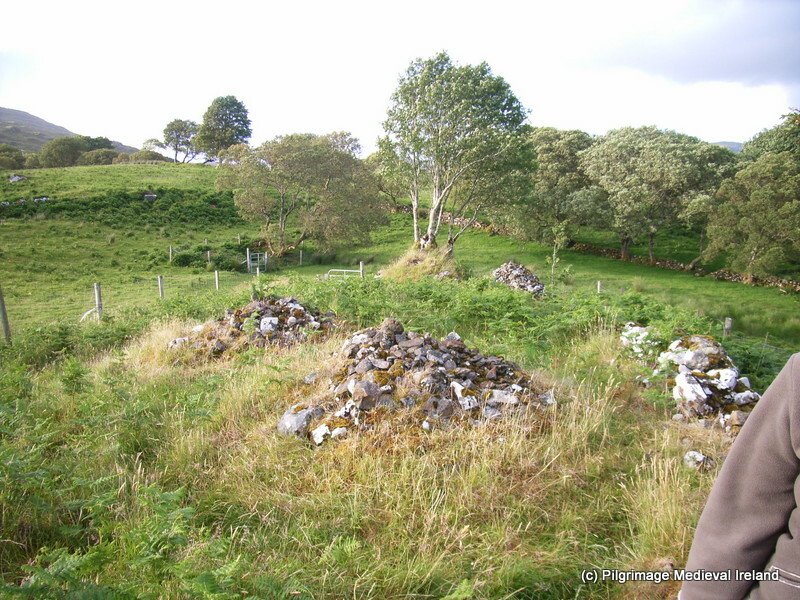 There are two cairns beside the well which have kind of merged together and are covered with vegetation. Close to the well is a wedge shaped graveyard which is defined by a stone wall. The graveyard was used for the burial of adults until the 1840’s and for unbaptised babies until the 1930. Within the enclosure is a stone altar with a metal cross beside an old tree. Sitting on the altar are a number of holy stones one of which is a quern stone. There are a number of low stones in the grass which act as graves marker and four low stone mounds or penitential cairns scattered about the graveyard. According to Walking Ireland Website the site was used during penal times as a safe place to say mass. The priest was said to travel up and down the river Eany between the Alt in Ardaghey saying mass in each, on alternate Sundays. The bullaun stones were said to have been used as candle holders. Fr. Dominic Cannon was parish priest of Inver from the 1770″s until his death in 1801. St Colmcille’s Arch is another part of the pilgrim landscape. 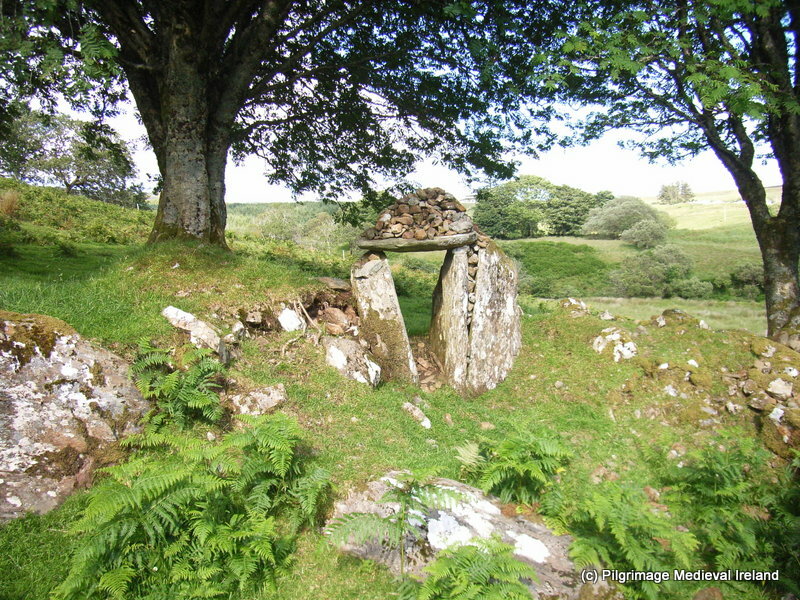 The arch is what appears to be the remains of a ‘Megalith’ it consists of two orthostats (upright stones) approximately 1m high with a lintel stone resting on them. Piled on the lintel stone are small stones which form a pyramid. When you pass through the arch you enter a sub oval enclosure roughly 5m by 6m. 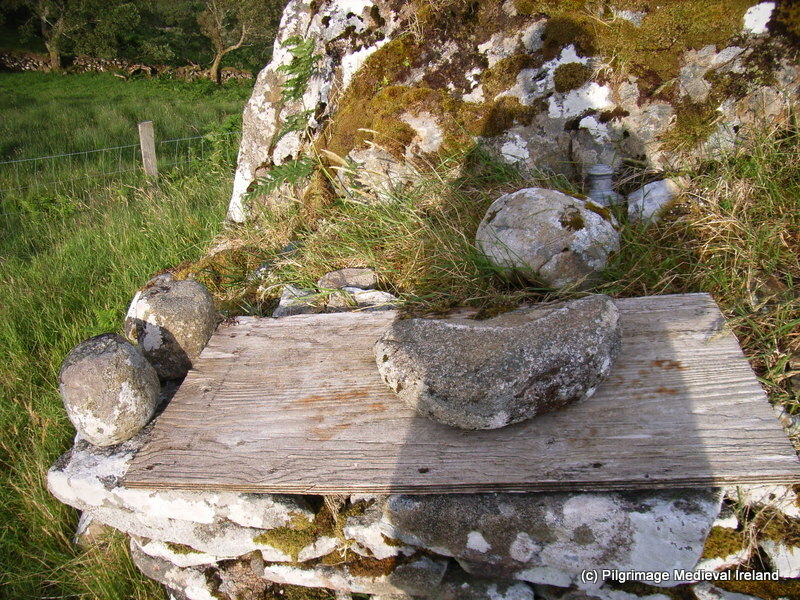 As well as prayers being said at the well the Rosary was recited and Paters and Aves were said as the pilgrim made his or her way round the heaps or cairns walking on the right hand or deiseal and placing a pebble on top of the cairn as the prayers were said. Disert is renowned for cures, and I have already mentioned the healing stone east of the megalith where penitents lay on the flag and pressed their back into the cavity, to cure backache. The stone reminded me of St Kevin’s chair at Hollywood. Penitents would also crawl through the megalith (St Colmcille’s arch) and rub the affected part of the body against the stone. The water of the well was a cure for tooth ache. The water in the bullaun stone was a cure for warts. The quern stone was used to cure eye complaints, the pilgrim would hold the stone up to their eye and look through the hole at its centre. 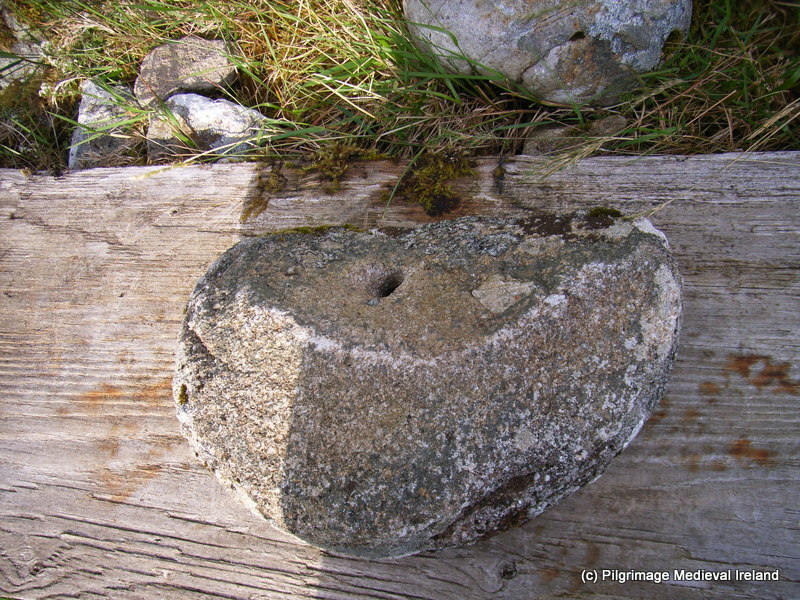 Quern stone known as the “Cure”. Local tradition has it that a test of male virility was to carry two stones from the altar in the graveyard to the well and back three times, whilst holding them from the top. On the left of the photo are the stones carried to the holy well and back. Anon. Information Board at the Site. Beglan, F.(unknown) Disert: St Colmcille’s Well and Megalith.unpublished. Meehan, H. 1997. ‘Disert in the Blue Stacks.’ Donegal Annual, Vol. 49, 12-23. O’Donovan, J. 1835. Ordnance Survey Letters Donegal. 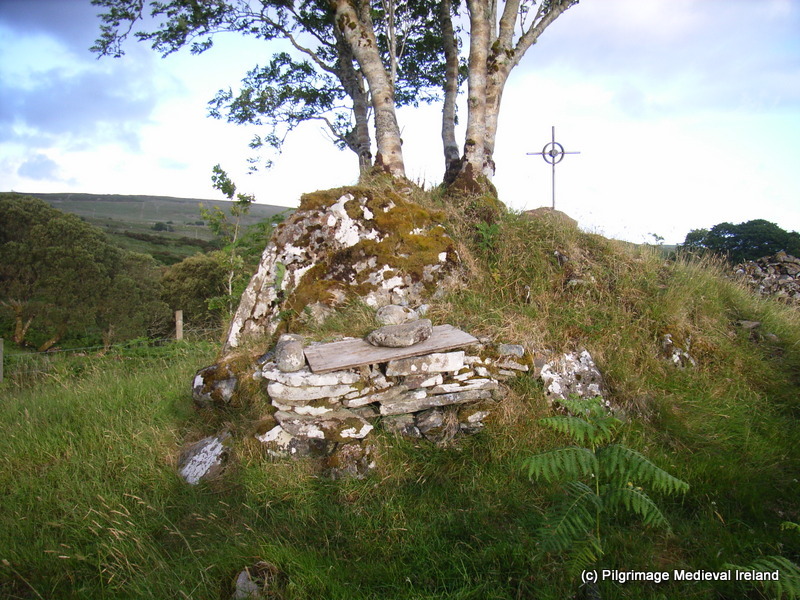 This entry was posted in Bullaun stone, Holy Well, Modern Pilgrimage, Patron Day, Uncategorized and tagged Disert Donegal, feast St Colmcille, healing stones, holy well disert Co Donegal, St Colmcille's Holy Well. Fantastic pics and what a site… stunning. Have come across similar clay traditions in Connacht, especially with 19th cent emigration. The clay from similiar holy sites was sent with them on the boat for protective charms; but only after being reverentially removed by local hereditary ‘keepers’. Thanks so much for the information terry, holy clay was also taken from Ardmore and Clonmacnoise. Really interesting topic.